The SU-100Y is a premium Rank III Soviet tank destroyer with a battle rating of 5.3. It was introduced in Update 1.51 "Cold Steel". A rather large profile tank destroyer on-par with the KV-2, but with a much more powerful 130 mm naval cannon, it serves well as a defensive vehicle against an offensive force. Suspension wheels are 20 mm thick while the tracks are 30 mm thick. The protection is only 60mm thick at its strongest. So it will not absorb any rounds anytime soon. Weapon calibres exceeding 20mm can pierce the armour, turning SPAAG into a real threat, if close enough. It is a good idea to stay with teammates or remain at distance from the main battle. Ammo racks of the SU-100Y. This tank is all about the gun. It defines what being a bonafide tank destroyer is. Bad armour, bad mobility, but amazing firepower. Just park the the tank in a position where the SU-100Y will be difficult to flank. That way when the vehicles does fire the gun, it can immediately run and hide while the gun reloads. It can not be emphasized enough, this tank can not let itself get shot at. It just doesn't have the armour. But once ready to let one of thee 130 mm shells loose, this tank fears few. 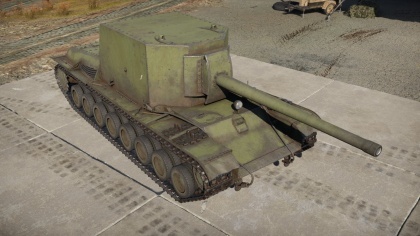 SU-100Y's B-13 cannon is one of the most powerful guns in the game. 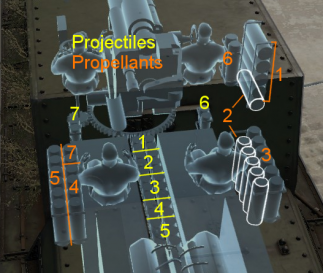 Able to penetrate ~200 mm of armour at 500 meters. 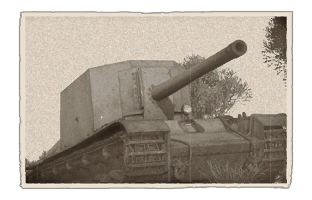 No tank at its BR can reliably bounce a shell from this tank. Astounding 2.35 kg of TNT explosive filler in the PB-46A APHE shell. Can reliably one shot any tank in the game, including the Maus. With 5 degrees of gun depression, SU-100Y has better gun depression than nearly every other Russian TD. SU-100Y has a very powerful engine. Accelerating to its top speed and maintaining it even while going up hill is no problem. Six man crew gives this tank a decent chance of surviving a penetrating shell. Huge fear factor, no tank wants to get shot at by the 130 mm. Like with every other premium tank, it has a RP and Lions boost. Skilled players will recognize the threat an SU-100Y poses. Expect to be the center of the enemy's attention. This is a huge tank. Finding decent cover or a good ambush location is difficult at best. Sub-par armour for the BR. Every gun that this tank can face poses a serious threat. Extremely vulnerable cannon breech and barrel. Problematic as a single hit to them will result in them being in critical condition. With terrible maneuverability, horrifying reverse speed, and massive size, dodging enemy fire is nearly impossible. Even a good crew will take more than 20 seconds to reload the gun. After the failure of the vehicle from testing in the Winter War, the T-100, along with the SMK, fell back into the drawing boards along with other designs that didn't make the cut. But in December 1939, the Red Army requested that Factory No. 185 produce a vehicle based on the failed T-100 chassis. The specifications were for the vehicle to not only operate as a self-propelled gun, but in a multitude of roles such as a bridge layer, explosive transporter, and tank recovery. Development started with the proposal to mount the 152 mm cannon onto the T-100 in order to be able to combat fortifications like the KV-2 with the same armament. The factory manager instead proposed the mounting of a 100 or 130 mm naval gun onto the vehicle instead, and this proposal was accepted on January 8, 1940. The designs, designated T-100-X, was sent to the Izhorskyi factory. At that moment, the T-100-X had a box-shaped fighting compartment with a 130 mm B-13 naval gun. The vehicle had a torsion-bar suspension to stay mobile. Over time, the prototype was redesigned with a modified fighting compartment and such and was resubmitted to the factory for production on February 24, 1940 and redesignated as the SU-100Y. The produced design was tested in March, but the design was dropped from production due to the low demand and the ending of the Winter War. This leaves the SU-100Y with only one prototype ever built. Other methods to either modernize the T-100 or into other variants were made in complementary to the SU-100Y, such as mounting the 152 mm M-10 gun and designating it the T-100-Z. This idea never went past the drawing boards as the success of the KV-1 and KV-2s proved the designs unnecessary. Another idea was to use the T-100 as coastal defense weapon with the 130 mm gun on a turret than a casemate structure, along with three machine guns, like the T-100-Z, this didn't pass the drawing boards. The SU-100Y prototype was sent to Kubinka in 1940 once the project stopped, however in the Battle of Moscow in 1941, the SU-100Y and its T-100 self-propelled variants SU-14 and SU-14-1 were pressed into service in the Independent Artillery Division for Special Duties. Combat records for these units are not known, but it left the SU-100Y in intact shape, allowing it to be preserved today in the Kubinka Tank Museum. Skins and camouflages for the SU-100Y series from live.warthunder.com. This page was last edited on 11 January 2019, at 22:22.